The wonderful fall foliage can instantly make your home look more attractive for showings. However, this doesn’t have to mean that you should forget about lawn maintenance during this time of the year. So, keep the falling leaves at bay with frequent raking. Once your lawn is looking its best, you should take some time to decorate it. For that purpose, today we want to show you several amazing fall front yard decorations that will fascinate you. 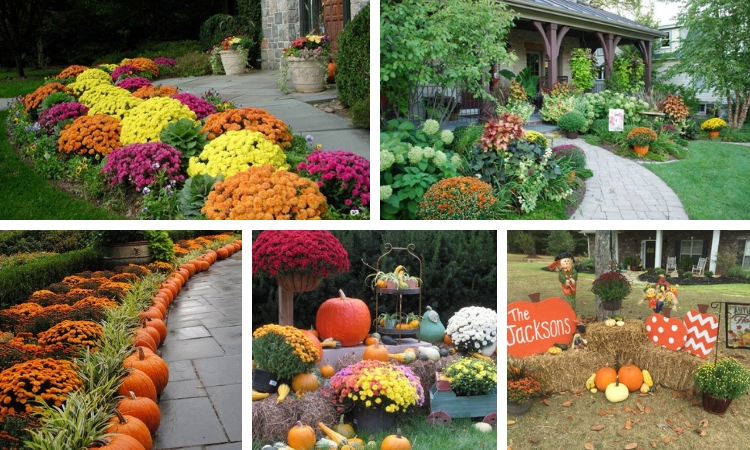 So, what should be part of your front yard this fall? Some pumpkins? Well, of course, pumpkins are one of the main symbols of this lovely season. And besides preparing some delicious recipes with them, you can also decorate your home and outdoor space with them. Set some on the porch, on the staircase, or maybe arrange some on the yard. Or you can even create some pathway out of pumpkins to add up to the curb appeal. Although, flowers are a must-have during the spring and summer time, you can also decorate the yard with some flowers in fall too. The best flowers for this season are mums. They can be found in all colors possible. You can either stick to one or two colors. Or you can arrange a transition of related colors. Just make sure you choose colors that best complement the existing landscape. Mums are also great for containers. You can find them popping out from clay pots. Or you can be more creative and place some into a whiskey barrel, a wheelbarrow etc. Combine them with some pumpkins and trailing foliage plants. No rules, simply arrange them in the best way to give you yard the best look. Or besides whiskey barrel or a wheelbarrow, you can also use a basket of a bike to set place some mums. Place the bike next to some tree in your yard. Add some pumpkins in front for more fall-inspired decor. The above fall front yard decorations are just some of the many possible ways of how to decorate your yard inspired from the fall colors and symbols. Tell us in the comments which one of them did you like the best. And of course stay up to date with us to find many other decor ideas for your outdoor space.